On August 16, MHCAM reopens to the public after eleven busy weeks of constructing walls, painting galleries, refurbishing pedestals, moving large, heavy, and fragile works of art, installing vinyl, building mounts, framing works on paper, changing lightbulbs, and re-designing object labels. This ambitious undertaking has involved every member of the Museum staff, although special recognition is due to Museum Preparator Jacqueline Finnegan, Collections Manager Linda Best, Curricular Preparator Sam Lopes, Contract Preparator Bob Riddle, Museum Guard Sue Sormanti, and Education Assistant Jaime Pagana for their immense effort and commitment to fulfilling the ambitious goals of our new, museum-wide exhibition 140 Unlimited: Recent Acquisitions in Honor of the Mount Holyoke College Art Museum’s 140th Anniversary. 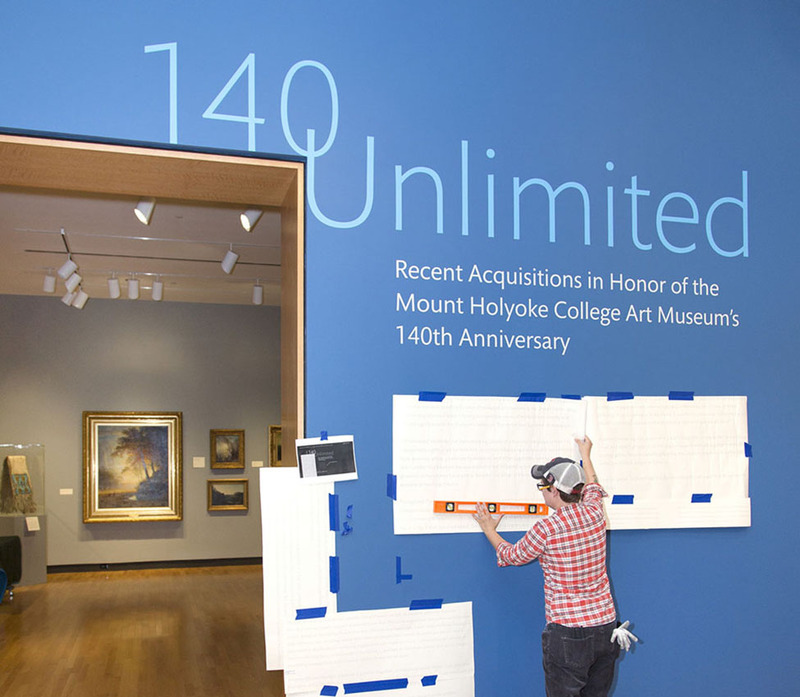 While there is still more to do before the official unveiling of 140 Unlimited on September 6, several re-installed galleries are now open. Visitors will encounter recent acquisitions interspersed with familiar highlights, as well as fascinating objects from the collection that have rarely, if ever, been on view. New thematic introductions and object labels will also grace each gallery, thanks to a comprehensive re-labeling campaign overseen by Assistant Curator of Education Kendra Weisbin and Art Museum Advisory Board Fellow Taylor Anderson. We hope you’ll visit soon and enjoy the new displays and wonderful works of art that comprise this special 140th anniversary exhibition at MHCAM. Wall color selection is a subtle art! Echoing Mount Holyoke College's logo and MHCAM's own new graphic identity, a cool, medium blue seemed the appropriate way to go for the 140th anniversary. But one must also choose a color that complements the art on view. For the exhibition's introductory gallery, five different blues were considered. Here, Associate Curator Hannah Blunt contemplates the options. The ultimate choice? Pratt & Lambert Monsoon. In the Harriet L. and Paul M. Weissman Gallery, two new walls will divide up the space for an installation of contemporary art, including recent acquisitions by artists Mary Lee Bendolph, Chantal Joffe, Jasper Johns, Kiki Smith, and Dorothea Tanning, among others. Built by Contract Preparator Bob Riddle and Curricular Preparator Sam Lopes (pictured here), the walls are a robust 10' high and 2 1/2' deep. Another meticulous step in the installation process is checking the light levels for works on paper. Paper is highly sensitive to light, which can cause rapid fading and disintegration if not carefully controlled and monitored. Here, Museum Preparator Jacqueline Finnegan uses a light meter to check the number of foot candles on a group of photographs. Contract Preparator Bob Riddle has been sharing his installation expertise, carpentry skills, and his entire workshop of tools with MHCAM for more than 15 years. Making object mounts, building pedestals, painting walls, lifting very heavy sculptures, and climbing tall ladders--just a few of the things he's been occupied with this summer.